New Delhi: Vice President of India M. Venkaiah Naidu on Friday said that Entrepreneurship development is an integral part of farming process to increase the profitability of farming. He was addressing the gathering after inaugurating the 9th ‘Agrovision’ Workshops, National Expo & Conference, in Nagpur, Maharashtra. Chief Minister of Maharashtra, Devendra Fadnavis, the Union Minister for Road Transport and Highways, Water Resources and Ganga Rejuvenation, Nitin Gadkari, the Minister of Energy, New and Renewable Energy, Maharashtra, Chandrashekhar Bawankule, the Minister of Agriculture and Horticulture, Maharashtra, Pandurang Fundkar and other dignitaries were present on the occasion. The Vice President said that unless we create a value chain involving the producer till consumer the profitability of farming shall not improve. He further said that in the last few years there has been an agrarian crisis and the profitability of farm sector has declined. This is mainly because farmers have medium to small holdings, and poor market access and also too much dependence on few crops and very little diversification, he added. 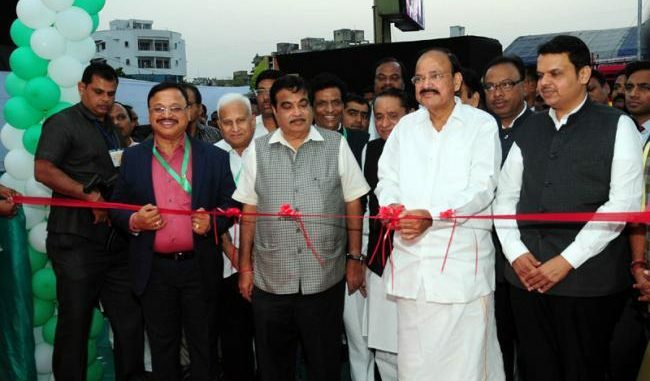 The Vice President said that Agrovision has now emerged as the Central India’s Largest Agri Summit and is strengthening the confidence of farmers to make agriculture an economically viable and a sustainable profession. The prosperity of the nation is linked to the betterment of farming community and naturally they need to be enlightened on the use of modern technologies for achieving sustainability and profitability, he added. The Vice President said that the farmers of this country made the nation self sufficient in food milk, vegetables, fruits, cotton sugar and many other agricultural produce through a series of revolutions like green, white and blue revolutions. Unfortunately the increased production has not resulted in proportional increase in the farmers’ income, he added. The Vice President said that the vision of our founding fathers was to have an India that is prosperous, peaceful and progressive. He further said that the Agrovision carries a similar vision to drive its mission forward and in order to move towards home grown food security, we have to create an effective agricultural eco-system. Knowledge sharing and encouraging adoption of new technologies is an integral and key part of this eco-system, he added. “I am extremely happy to participate in this mega exhibition organized by Agrovision. I understand that this has been an annual feature and lakhs of farmers visit this event and gain knowledge from the exhibition, workshops and conferences organized along with the exhibition of modern technology. It is a matter of great satisfaction to me that you educate the farmers by arranging free workshops on diverse areas of agriculture so that they can improve their living from the farm sector. Another activity that is praise worthy is arranging special conferences on topical issues that attract agri-entrepreneurs in this region. I firmly believe that unless we create a value chain involving the producer till consumer the profitability of farming shall not improve. Therefore, events like this can play a major role in transforming the current agricultural situation. Vidarbha and surrounding regions are mainly dependent on rain with very little irrigation. However, the area is endowed with fertile soil, good sunshine and hard working peasants. In the last few years there has been an agrarian crisis. The profitability of farm sector has declined. This is mainly because farmers have medium to small holdings, and poor market access. Another reason for the distress is too much dependence on few crops and very little diversification. Farmers have to move to horticulture, animal husbandry, processing and several such allied sectors if their incomes have to be improved. Realizing the need to diversify agriculture and to create value chain, visionary leader and chief Patron of Agrovision Shri Nitin Gadkariji, recognized the need for a platform to educate, innovate and encourage the farmers of this region nearly a decade ago. Today’s 9th edition of this event is a testimony of its success. I am glad that through Agrovision, special efforts are being made to educate farmers about the modern farm practices and new technologies. Here farmers, researchers, entrepreneurs, policy makers & other stake holders connected with agriculture come face to face to deliberate & discuss about various developments as well as current challenges in agriculture. Agrovision has now emerged as the Central India’s Largest Agri Summit and is strengthening the confidence of farmers to make agriculture an economically viable and a sustainable profession. I am happy to learn that many farmers from other states like Punjab, Haryana, Rajasthan will participate in this event along with farmers from adjoining states like AP, Chhattisgarh, Madhya Pradesh and Gujarat. Agriculture is the culture of this great country and around 52% people are directly dependent for their survival on agriculture. The prosperity of the nation is linked to the betterment of farming community and naturally they need to be enlightened on the use of modern technologies for achieving sustainability and profitability. The efforts of Agrovision are highly commendable and need to be replicated all over the country. The farmers of this country made the nation self sufficient in food milk, vegetables, fruits, cotton sugar and many other agricultural produce through a series of revolutions like green, white and blue revolutions. Unfortunately the increased production has not resulted in proportional increase in the farmers’ income. This is mainly because of the emphasis on primary produce and not linking it to market and secondary process product development. The next revolution shall come through development of the value chain and sharing the profit with primary producer, the farmer. Entrepreneurship development, therefore, is an integral part of farming process to increase the profitability of farming. I am told that AGROVISION emphasizes linking the produce to processing and marketing and therefore has invited several entrepreneurs to participate in this event along with farmers. I congratulate all those involved in organization of this mega event. In the past, Vidarbha was known for the crops of Cotton, Soybean and Oranges but in recent years other crops like Sugarcane, Rice, Pulses, Pomegranate, Turmeric, Ginger have seen a remarkable production here. The real impact of this event can be gauged from the fact that many farmers are now planting pomegranate, custard apple, amla, dragon fruit and other dry land fruit crops and getting huge benefits from farming. A current evaluation of impact has shown that in the last five years, pomegranate cultivation which was just 100 acres in this region in 2010-11 has now reached 5000 acres in all the western Vidarbha districts. Milk production has shown an upward trend. Sugarcane cultivation and sugar production have improved the quality of life of the farmers. Agrovision has achieved its goal of creating awareness about diversification of farming. Farmers are moving away from cotton- soyabean, millet and making a shift to Dairy, Horticulture, Sericulture, Bee Keeping, Floriculture and Polyhouse farming. The vision of our founding fathers was to have an India that is prosperous, peaceful and progressive. Agrovision carries a similar vision to drive its mission forward. In order to move towards home grown food security, we have to create an effective agricultural eco-system. Knowledge sharing and encouraging adoption of new technologies is an integral and key part of this eco-system. I congratulate Gadkariji who pioneered this initiative and the organizers of this event for revitalizing Indian agriculture. Intensification and diversification as well as end-to-end processing hold the key to improving the lives of farmers. Successive governments have been taking up a number of reform measures to strengthen the ecosystem but I think more time-bound, systematic and systemic efforts are called for. Irrigation is of course the most crucial factor. In addition to irrigation, the government is rightly focusing on infrastructure like rural roads, dependable quality power, godowns, cold storage facilities, refrigerated vans and market yards. Two other important building blocks of a robust ecosystem are timely credit facilities at reasonable interest rates and farmer-friendly insurance policies. These allow for farmers to invest in better, income-generating crops and agricultural practices and increase their incomes. The insurance cover shields the farmers against unforeseen climatic and natural disasters. The kisan credit cards and the Pradhan Mantri Fasal Bima Yojana (PMFBY) are steps in the right direction and need to be universalized. Marketing of agricultural produce and getting a fair return is a big challenge for most farmers. A new initiative called E-NAM seeks to remedy this situation by adopting an e-trading platform for agricultural produce. The Agricultural Produce Market Committee (APMC) Act is also being proposed to be amended by introducing single-point levy of market fee across a State and a united single trading licence. I see Agro-vision is an important step in enhancing awareness and transforming Indian agriculture to make it more productive. I hope to see more such initiatives in many more states in our country in the months to come.